CoShedule review: The best content calendar template on the market? Finding the right content calendar template is hard. I get it. It is even more tricky when content is a small part of your side-business business. Sometimes it feels like a full-time job just organising content and social media. However, it needs to be done, so we may as well work smarter. I have automated all of my content using CoSchedule and will review how it is all going so far. For clarity. I am a CoSchedule referral partner. However, this is an entirely honest review. I have a story about one of the many mistakes I have made when blogging, but I feel it is important to pull back the curtain a bit so you can see how we can all get stuck. This one is a bit ironic because I am sure if you asked one of my students to quote me they would say “if you fail to plan, you plan to fail”. Alas, I recently uploaded a request for guest posts on Source Bottle – I need to write about Source Bottle one day, I’ll add it to my CoSchedule drafts – and was inundated with the response. The website added it to their daily newsletter, and I opened Gmail to over 200 messages, with more coming by the hour. Don’t get me wrong; it was a remarkable response. However, I was not prepared to talk to that many writers who wanted to work with me. But, true to form, I gave it the old College try. I was swamped with requests and emails while I tried to plan publishing dates and keywords for the guest posts. My content calendar template was not up to the required standard. It didn’t go well. Planning all that content was near-impossible on my own. Hell, even organising my content was difficult. Truthfully, not correctly organising my content lost me writers who were willing to contribute. It sucked, and I wanted something better, so I went out to find a solution. I had heard CoSchedule being used on podcasts and in blogs before, so I gave it a look and started planning my blog correctly. 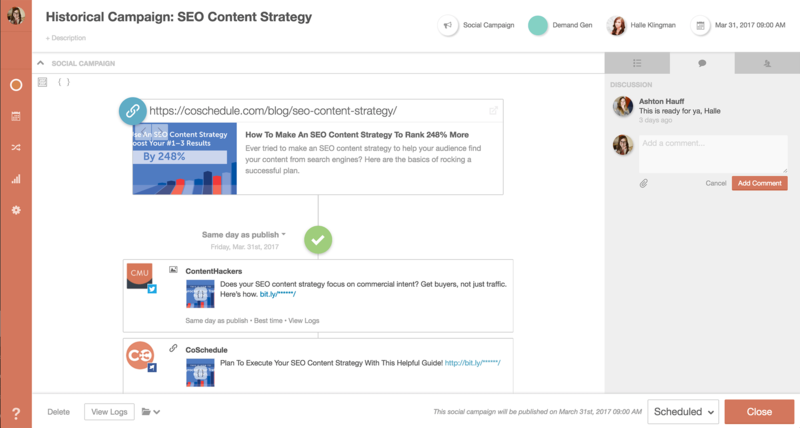 In essence, CoSchedule is a calendar that helps you organise your blog posts, marketing and so much more. Seeing you are more than likely starting on your blog journey, you would be using CoSchedule in a similar way to me. I have started organising and scheduling my blog posts and Facebook Live streams. The following video is from CoSchedule and briefly goes over everything that it does to manage your blog. Now, that may be a little overwhelming. However, if you’re a beginner, this is more what you need to see. In fact, I watched this very video before downloading my free trial. As previously mentioned, I sucked with organising my blog. I had a rough idea of what was scheduled and when, but it stopped there. My Social Media was even worse, a post came out when the article was published, but that was it. Now, I have all of my articles pre-planned, with the category, keyword, and author listed. From there I write my article (you can even write your article on CoSchedule) and get ready for publishing. I know what you’re saying, I can technically do most of that on Google calendar and save myself some money. However, the best part comes on the social media side. Before CoSchedule, I would share my blog post on social media when it was published, and maybe once or twice more. However, with CoSchedule, I can plan all of my social statuses for months in minutes. This has added thousands of clicks to my website that would not have been there otherwise. Plain and simple. In fact, odds are you clicked on this article from a CoSchedule planned post. With CoSchedule, you can pre-plan your social media posts months in advance. My CoSchedule review: is it worth it? I can only give my honest opinion on my experience. I cannot tell you that a particular product is perfect for your individual needs. However, I can honestly say that CoSchedule has changed the way that I blog. I now have more time to blog with a purpose and have left increased my engagement tenfold. If you are a blogger who is time poor, especially a teacher who is starting their side-hustle, then CoSchedule is at least worth the free trial. Get your copy here, and as I stated above, if you use the links in this article to access CoSchedule, I get a small piece of the pie to help manage this website. Thanks for your kind words, Vince! I’m glad CoSchedule helps you get your marketing taken care of while letting you stay focused on what’s important to you – your blog! We’re always happy to hear how people are putting CoSchedule to work for them. Vince this does rock. I used it in the past guest posting for someone. Super review. Thanks for the kind words, mate.